? ?The Weyburn carbon storage project in Saskatchewan, Canada, has entered a critical phase as authorities scramble to respond to claims that toxic amounts of carbon dioxide (CO2) have leaked out of the ground, contaminating soil and water, killing small animals, and casting doubt on the viability of carbon storage as a technical fix for global warming. Since 2000, the Weyburn project has been aiming to demonstrate that carbon dioxide (CO2) — the main global warming gas — can be safely buried a mile below ground. As reported previously, a technical study was released January 11 supporting claims that CO2 has leaked out of the ground at Weyburn, making explosive sounds, contaminating soil and water, asphyxiating small animals, and frightening Cameron and Jane Kerr into abandoning their farmhouse home. The release of the technical study by geological engineer Paul Lafleur was accompanied by a short video, a slide show, and a brief written history of the Kerr’s attempts to bring attention to these problems as far back as 2004. The Canadian advocacy group Ecojustice has been assisting the Kerrs. In its usual form, as a trace gas in the air, CO2 traps heat from the sun, slowly warming the lower atmosphere and surface of the planet. Atmospheric CO2 has risen 39% in the last 150 years, mainly as a result of humans burning fossil fuels (coal, oil, and natural gas). The warming, in turn, is destabilizing global climate, creating more droughts and floods, generating bigger hurricanes, and adding moisture to the atmosphere, which then creates more intense rain and snow storms, among other effects. The Weyburn project is intended to show that CO2 from fossil fuels can be captured, pressurized into a liquid, and permanently stored a mile below ground, keeping it out of the atmosphere — a process known as carbon capture and sequestration, or CCS for short. Since 2000, some 18 million tons of CO2 have been pumped below ground at Weyburn, to demonstrate CCS and to release oil from depleted reservoirs and bring it to the surface, a process called “enhanced oil recovery,” or EOR. Burning the recovered oil releases more CO2 than is buried below ground, so EOR actually makes global warming worse, not better. Nevertheless, proponents of CCS routinely point to the CO2 burial phase of EOR as evidence that CCS has already been proven successful. Most EOR projects are not monitored for CO2 leakage, so the claim that EOR demonstrates successful CCS is doubly duplicitous. Such claims are perhaps understandable because it would be hard to overestimate what’s riding on the success or failure of the Weyburn project — the largest CCS demonstration in the world. For one thing, Canada itself is counting on CCS to reduce the enormous carbon footprint of oil derived from Alberta’s extensive tar sands; for another, the U.S. is increasingly addicted to oil from Canada’s tar sands. If it is declared successful, Weyburn will be taken as powerful evidence that CO2 can be safely buried below ground worldwide — a technical fix for slowing global warming. If CCS could be deployed on a massive scale worldwide, then the era of fossil fuels could be extended for several more decades at least. If CCS could prevent further global warming, there would be no urgent need for greater efficiency or for renewable energy (solar, wind, and geothermal), and wealthy nations could continue business as usual. (Third world nations might still have major problems adjusting to climate changes that would unfold for decades even if CO2 emissions could be cut to zero today — such as disappearance of glaciers that provide drinking water to millions of people in parts of southern Asia and Latin America.) Because CCS promises a “get out of jail free” card to fossil fuel-based economies, carbon storage is being promoted by a cluster of powerful government agencies, NGOs and industries, including coal, oil, natural gas, electric power, automobile, railroad, chemical and cement companies. Participants in the Weyburn project include agencies from Canada, Denmark, Great Britain, Greenland, Italy, Japan and the U.S.
CCS was first proposed in 1979 but no one took it very seriously until 1996 when BP, the British oil giant, and Statoil, the Norwegian state oil company, began burying CO2 beneath the North Sea at a place called Sleipner. The U.S. government began promoting CCS in 1997 by funding a demonstration project called Futuregen in Illinois, which has, so far, not managed to bury a single ounce of CO2 in the ground. Because Futuregen has been delayed for so long, the Weyburn project finds itself in a blinding spotlight as the world’s largest commercial-scale CCS project. Therefore, news reports of CO2 leakage at Weyburn created a “public relations crisis” for CCS proponents — and indeed fossil fuel corporations — worldwide. How this crisis was handled speaks volumes for the future of CCS, and. frankly, that future looks like a public relations train wreck. Instead of responding to the Kerr’s situation with scientific detachment and offers of help, Weyburn authorities circled the wagons and began issuing denials dressed up in scientific jargon. The same day the Toronto Globe & Mail carried the Weyburn story, the Petroleum Technology Research Centre (PTRC) — which monitors Weyburn for leaks — issued a press release asserting that its “extensive” monitoring program at Weyburn has never found any evidence of CO2 leaking from deep underground — though they failed to mention that they had never tested the Kerr’s property. Eight days later the PTRC issued a 7-page report, denying that there was a shred of evidence that CO2 contaminating the Kerr property resulted from Weyburn’s CO2 burial. (Notably, the PTRC still had not taken an samples from the Kerr’s property.) The report concluded, “The phenomena observed at the Kerr property can be explained by near surface processes including microbial generation of soil CO2 and methane.” In other words, Mother Nature did it. If ever there was a modern David and Goliath battle, this is it. The Kerrs — two farmers — hired a lone geological engineer, Paul Lafleur, to examine their soil and water and write up his findings. The PTRC’s 30 governmental and corporate partners have an $85 million budget devoted to monitoring soil and water, specifically looking for CO2 leakage from Weyburn. Scientific American, a magazine that has long promoted CCS, weighed in Jan. 20 on the side of PTRC and the Weyburn project. 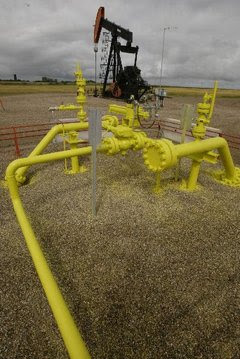 Scientific American’s reporter, Mike Orcutt, interviewed Steve Whittaker, the senior project manager at Weyburn, who said the oil reservoir has “contained oil for tens and tens of millions of years” below ground at Weyburn. “These are natural containers,” Whittaker said. Mr. Orcutt neglected to ask Mr. Whittaker, “Is it possible that 170 CO2 injection wells poked through the rocks at Weyburn — not to mention the 320 oil production wells poked through the rocks at Weyburn — might have created pathways for CO2 to escape?” It seems an obvious question. Despite their deep connections to Canada’s federal and provincial governments, both the PTRC and the Weyburn project managers pretended they had been completely blind sided by the Kerr’s little report. But they could not have been. The Kerr’s have been trying since 2004 to get someone in government –anyone — to pay serious attention to the booming noises (“like cannons going off,” says Jane Kerr) that preceded the appearance of foaming water in the Kerr’s North and South Ponds, 3-foot-tall cones of algae growing in their ponds, and dead birds and mammals strewn about the shores. The narrative history of the Kerr’s CO2 problems, written by Ecojustice attorney Barry Robinson, details how the Kerrs have been ignored, jerked around, and lied to by agencies whose mission is to protect the public and the natural environment. It appears those agencies were more interested in protecting the interests of the many fossil fuelers who have put all their eggs in the CCS basket. The report of leaks at Weyburn follows on reports from Sleipner, off the coast of Norway, that seismic mapping studies have been unable to locate all the CO2 that been buried there since 1996. No one knows for sure whether it has leaked out or not. If nothing else, both Weyburn and Sleipner demonstrate the technical and institutional difficulties inherent in monitoring for CO2 leakage from deep burial sites. If CCS mavens have their way, the world will develop tens of thousands (possibly hundreds of thousands) of CO2 burial sites in Canada, China, Russia, India, the U.S. and elsewhere. Their plan it to develop a CCS industry larger than the petroleum industry is today. It is hard to imagine that reliable monitoring techniques, operated by credible agencies, can be developed in time to make any real dent in the global warming problem. In sum, it is not entirely clear what’s going on at Weyburn (or at Sleipner), but “Mother Nature did it” is not a response that generates confidence in those responsible for long-term burial of hazardous waste CO2. Perhaps more than the claim of leakage itself, dismissive denials by governments, oil corporations, universities, and the mainstream press are what will finally nail shut the coffin that CCS officials have chosen to make their beds in. Peter Montague is a journalist, historian and science writer living in New Brunswick, N.J. From 1986-2009, he edited and published Rachel’s Democracy & Health News. Currently he serves as executive director of Environmental Research Foundation.